stampwithamber - Amber Meulenbelt, independant Stampin' Up! demonstrator: Ink-redible!! New demonstrators who join Stampin' Up! during the promotion period will get a FREE collection of Classic Stampin' Pads with your Starter Kit! 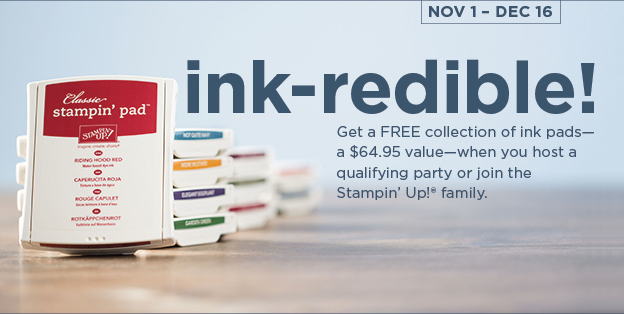 It's an INK-redible time to host a Stampin' Up! party and join the Stampin' Up! family! I also would like to give a shout-out to all who placed orders on Monday for the big stamp sale! You helped me order over 30 stamps sets in one day - and across North America, Stampin' Up! had 193,000 stamp sets ordered!! That's more in one single day than ever before! (In a typical day, 14,000 stamp sets are ordered). Because of that high volume, there may be some delays in shipping.